After every storm God always provides a rainbow. How many times have you went thru life where you did not think things would get any better?? How many times did you doubted that God had your situation on his lists of things to accomplish? What do you need to do to believe that the Rainbow is shining bright for you??? I think during one of the worst times in my life, I lost hope that God had my situation covered. I lost hope that the rainbow would be there for me. I challenge you to never forget the rainbow and never forget that “good is coming”. 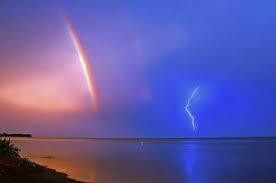 Always remember there is a RAINBOW after the Storm!